Human development starts from the body and moves up to the mental. The further development to spirit is not considered here. Human consciousness consist of three levels or planes – the physical body, the vital plane of life energy and the mental plane of conscious awareness. The physical is the plane of form. The vital is the plane of energy. The mental is the plane of thought. Each of these three planes can be further subdivided into physical, vital and mental components, because each of these elements exists in all planes. Physical plane: We see a person as a body, which is physical. The physical body has a vital part, the nerves, which are full of energy. It also has a mental part, the physical brain that houses the Mind. Physical skills express a knowledge that denotes the presence of mind in the physical body. Mental plane: The brain is the physical part of Mind. Mental sensations are the vital part of Mind. Thought issues from the mental part of the mind. The physical part of the Mind is that which is related to physical things and activities. Thus, scientific classification of substances, engineering, technology, planning and organization of activities issue from this center. The vital part of the Mind is the center of the poet’s sentiments. The mental part is the source of pure abstract thinking, philosophic ideas and ideals. Vital plane: The nerves are the physical seat of the vital. The physical part of the vital generates the physical sensations of the senses. The pure vital is source of vital energy, the seat of enthusiasm, excitement, interest, passion, etc. The mental part – cunning – consists of thoughts that are concerned with life’s physical safety and success. These three planes, each with their three subdivisions can be depicted as nine levels, starting with the physical body (level 9) and rising to the pure thought mind in the mental plane (level 9). The evolution of consciousness begins as with the emergence of animate life in inanimate physical forms and continues with the emergence of conscious mentality in subconscious life forms. 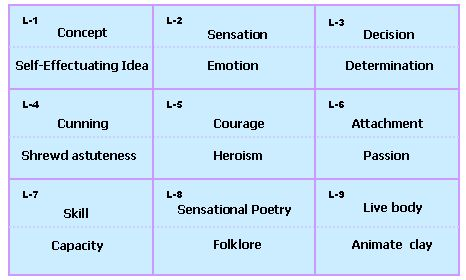 When the physical (level 9) rises to the vital, its first expression is passion (level 6). Physical skill is the mental part of the physical (level 7). Mental emotion is discernible in our sentiments (level 2). Physical emotions are the feelings of the body (level 8). It is the stage in which folklore is created by rural poets. So, we have 9 divisions as follows. These nine levels provide a convenient system of classification for understanding the evolution of human consciousness and the interaction with various stages of that evolution in social development. Since every part includes the other parts within itself, no rigid distinctions can be made between them. The philosopher is mental, while the ploughman is physical. Such a clear-cut distinction cannot be made with a thoughtful leader because of his capacities for organisation. His capacity for thought issues from the thinking mind (level 1) and his capacity for organization from the physical mind (level 3). His capacity for leadership requires emotional courage (level 5) and physical stamina of a healthy body (level 9). In this introduction, we can only indicate the major attribute of each of nine levels. Each of the nine levels can be further subdivided into two parts – surface and depth. The surface part is referred to as the ‘consciousness’ of that level and the depth is referred to as its ‘substance’. At each level, the substance denotes a more deeply-seated and intense characteristics. In the table below, each of these 18 levels is characteristized in terms of one major trait. The trait listed above the line in each cell refers to the consciousness of that level and the trait below the line applies to the substance of that level. In a similar manner, a more precice and exhaustive study of human personality can assign a specific number to each human characteristic. Apart from the division into nine levels, surface and depth, these traits can also be subdivide into positive and negative. Such subdivisions are endless. History can also be analyzed as a journey through these nine stages. Leaders, average and below average people in each epoch can be evaluated in these terms. This will confirm two facts that: first, even long ago the heights of thought were born; and, second, even today the clod persists. To evaluate the bulk of the vanguard and the rearguard in each century will demarcate the curve of human growth. See also, a detailed analysis of each of the Nine Levels .